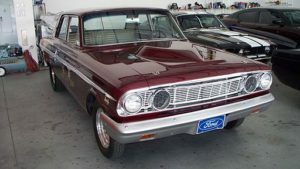 Ever since the Ford Motor Company released the 1964 Ford Thunderbolt, it was a surprise to many that their production only continued for over a year. All told there were only about 100 units of these cars ever produced. The Thunderbolt had a four-speed transmission and it was an automatic. It is of common knowledge that most automobiles in America at this time were automatic since the stick shift had low preference value. This was because driving a stick shift back then, was seen as a harder way to drive. Of course many people today are now looking to buy sticks because it is more of a “cool” factor than anyting else. 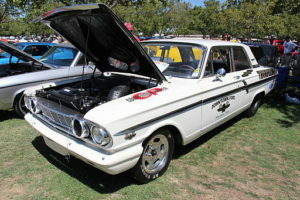 The car possessed a 427 High Riser racer engine that had a distinctive ram air induction system, twelve to one compression ratio, aluminum scatter pump, dual 4-barrel Holley carburetion, tubular headers, trunk mounted battery, revised drag suspension, heavy duty breaks, electric fuel pump, gauges, tachometer, drag tires and special wheels. 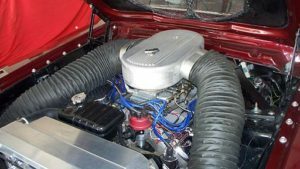 This type of engine was already street legal in America as early as the 60s – that is why a lot of street racers grew fond of the 500 horsepower vehicle.The Thunderbolt was very lightweight, which was in fact a big advantage for car racing since the lighter the car, the faster it would figuratively fly. While this wasn’t the fastest muscle car in its class, it could really hold its own on any dragracing strip. However, this car isn’t so popular because of its power, but because of how rare it is. Due to its minute production, the 1964 Ford Thunderbolt is like caviar to car enthusiasts since only a few were ever produced. There even was once a countrywide search for the few ones that could still be auctioned or bought from previous owners. That is why the thunderbolt is one of the most sought after muscle cars by collectors, much like the Super bird.Sure enough, this superb muscle car is indeed a gemstone in the automobile industry. For those who are lucky enough to own the Thunderbolt, it can fetch up to as much as $200,000 at an auction, making it one of the most valuable classic cars I know of and I can only see this value going upwards for many years to come. To me, owning this vehicle is like owning stock in a valuable company.